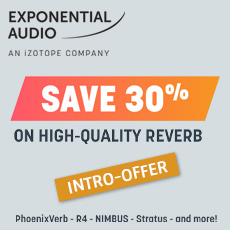 Classic reverb meets modern technology - R4 uses an updated R2 algorithm to bring the sought-after character of vintage reverb hardware to your DAW, delivering retro tone coupled with modern filtering and gain controls for an update on the vintage reverb experience. Stop time and space with Freeze - Freeze gives you the ability to easily stretch an instant of reflected sound into infinity, and can also be combined with the Warp module’s overdrive and compression to craft a dramatic sustained reverb drone or striking cinematic ramp effects. Make your reverb a little more musical - With the ability to sync to the tempo of your session, R4’s global pre-delay, reverb delay, and dynamic tail suppression integrate seamlessly with your music to place the reverb into the groove for a balanced mix in any musical context.